What is happening with OSAP? Change of the definition of 'independent student’ - An independent student will be defined as a student who has been out of school for six years, rather than four years. Change of loan to grant ratio of funding for second-entry programs - At least half of the funding that students pursuing second-entry programs will receive, such as graduate programs or law school, will be made up of loans. For more information check out this article from the Western Gazette: What exactly do the OSAP changes mean? When applying for OSAP, an independent student uses their own income to determine which grants and loans they are eligible for. On the other side of the coin, dependent students are students whose grants are based on their parent's income. How will this affect student groups? Yes, yours too. Even if you don’t directly collect fees, all groups on campus are accredited through the same Student Organizational Policy. if your club falls under a College Government, their funding will become optional. If you are a CSA club, the CSA fee contributes to the clubs program and allows us to maintain our insurance, your Gryphlife pages, and our status as an accrediting student body. Wait… All fees are optional now? No, most are still mandatory. Of the fees on the line, the only fees that will truly be on the line are those that fund student groups or equity-based programs. 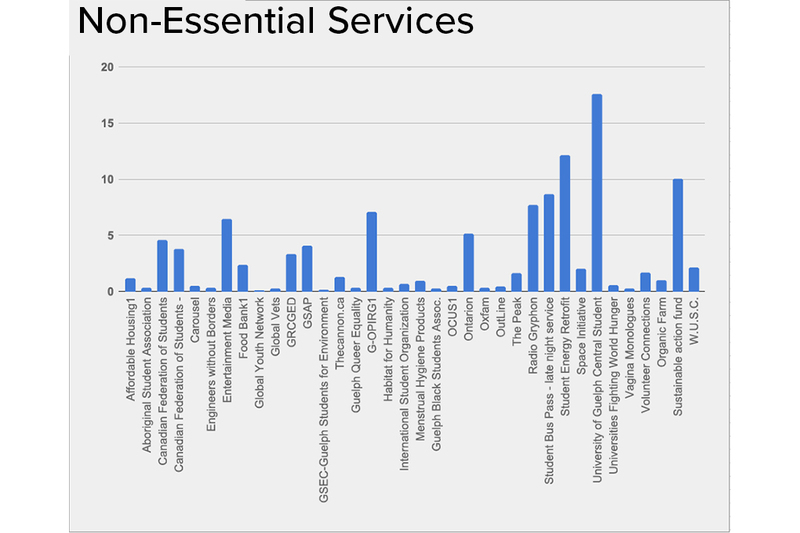 Athletics and recreation, Career services, Student buildings, Health and counselling, Academic support, Student ID cards, Student achievement and records, Financial aid offices, Transit passes, Health and Dental insurance, and Campus safety programs fall into the “mandatory” categories. While not all of our fees go towards these topics, most of the ancillary fees we pay on campus will remain in place. The cuts threaten those fees that provide for campus culture. 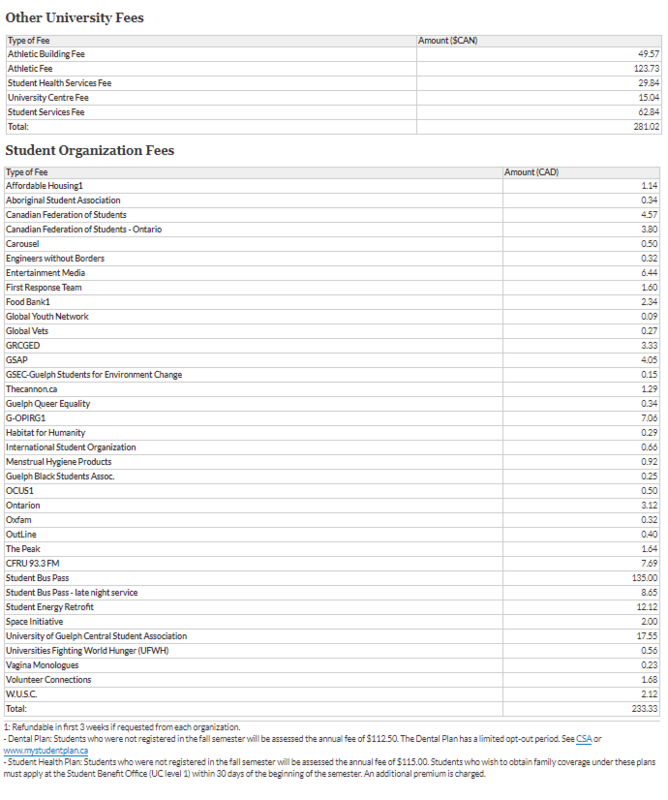 The Ontarion points out that of the $527.35 that all University of Guelph Undergrads pay, only $109.73 will be optional. In an affront to campus culture, and not basic services. Well, $109.73 is a lot of money. While this is true, the comparable difference between what is funded from the soon-to-be-optional fees and what is funded by the continued compulsory fees is dramatic. Why do I still have to pay for the transit pass? If an institution has a compulsory ancillary fee to support student transit passes that were established prior to January 17, 2019, compulsory ancillary fees may be charged for the duration of the agreement and any subsequent renewals of these agreements. Renewals are understood to be subsequent contracts between the same parties creating uninterrupted service to students. No compulsory ancillary fee may be charged to support a student transit pass that did not have a fully executed agreement in place by January 17, 2019 (with the exception of agreements considered renewals as noted above). Who decides which fees are mandatory? The University has put together a steering committee to review the provincial Guidelines and direct our ancillary fees as appropriately as possible. There will be more information about which fees will be mandatory or not over the course of the summer, so it's possible that the $109.73 price tag estimated by the Ontarion could shift up or down. Image: for a full explanation of current ancillary fees, stay tuned throughout the summer. Ontario, Minister of Education, and Ministry of Training, Colleges and Universities. “Tuition Fee Framework and Ancillary Fee Guidelines: Publicly-Assisted Universities.” Tuition Fee Framework and Ancillary Fee Guidelines: Publicly-Assisted Universities, Government of Ontario, 2019. PDF located at bottom of the page under "File Attachments"
 Yang, Alfred. “OSAP 2019 for Independent Students.” Proliteracy.ca, 13 Feb. 2019. proliteracy.ca/blogpost/osap-2019-for-independent-students. Mallees, Nojoud Al. “What Exactly Do the OSAP Changes Mean?” The Gazette, 16 Feb. 2019. westerngazette.ca/news/what-exactly-do-the-osap-changes-mean/article_67585e0e-3077-11e9-98a2-7b38eeffd284.html.